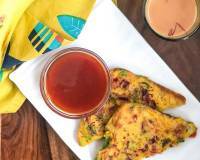 A lovely fusion recipe, Masala French Toast Recipe as an added Indian twist with the addition of a simple onion-tomato masala. 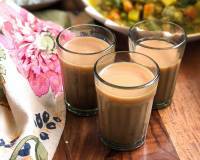 Serve this for breakfast along with green chutney and a bowl of fruits. 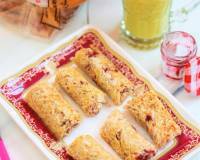 Masala French Toast is a delicious and quick to make tea-time snack recipe. 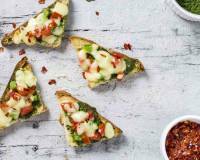 The addition of onion, tomatoes and green chillies for the topping the classic French Toast Recipe get a fantastic twist. 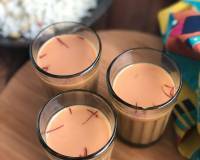 You can serve the Masala French Toast for the breakfast or tea-time snack along with a glass of smoothie or as an appetizer for the parties. Did you know: Tomatoes are widely known for their outstanding antioxidant content, including, of course, their oftentimes-rich concentration of lycopene. Researchers have recently found an important connection between lycopene, its antioxidant properties, and bone health. Fresh tomatoes and its juices have been shown to help lower total cholesterol, LDL cholesterol, and triglycerides. 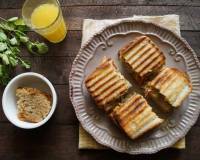 Serve the Masala French Toast along with the Green Chutney as an accompaniment. 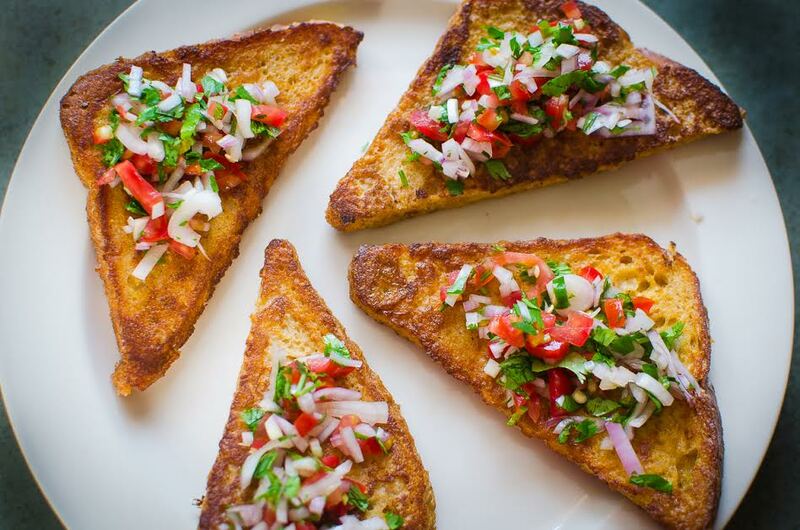 To prepare the Masala French Toast, first make the topping by chopping the onion, tomato, and green chili. Keep it aside in a bowl. Next cut each slice of bread diagonally into two triangles and keep aside. In a deep and wide bowl whisk the eggs along with milk, salt, red chili powder and black pepper for few minutes or till combined well. Heat butter in a skillet over medium heat. Dip one triangle of bread in the egg mixture until its evenly coated. Using a slotted spoon transfer the egg coated bread slice to the preheated skillet. Cook until evenly browned on both the sides, by flipping over alternatively. Once well toasted, transfer the French Toast to a wire rack. Cook the remaining bread slices the similar way. Once all the toast are cooked, arrange them in a serving platter. Place equal amount of onion mixture on each french toast. Garnish with chopped coriander leaves and finally sprinkle chaat masala on the top. 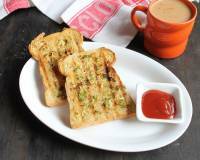 Serve Masala French Toast warm, along with green chutney and a cup of tea/coffee for the evening snacks or breakfast. Praerna is an ex-advertising and communication professional with an all-compelling obsession with all things to do with food. 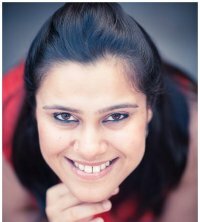 Along with her commercial photographer husband, she runs a boutique photography studio called Thoda Strong in the vibrant community of Shahpur Jat in New Delhi. Praerna is a professional food stylist and part time food blogger – and works in collaboration with food photographers and brands to create stunning, marketable and compelling images of food. When she’s not up to her elbows in a shoot, she enjoys creating step-by-step recipes, documenting her adventures in food and checking out new places around town in her food blog (http://food-dee-dum.com).